Shedden (52) leads the pack to victory, meanwhile Plato and Collard fall foul of each other. 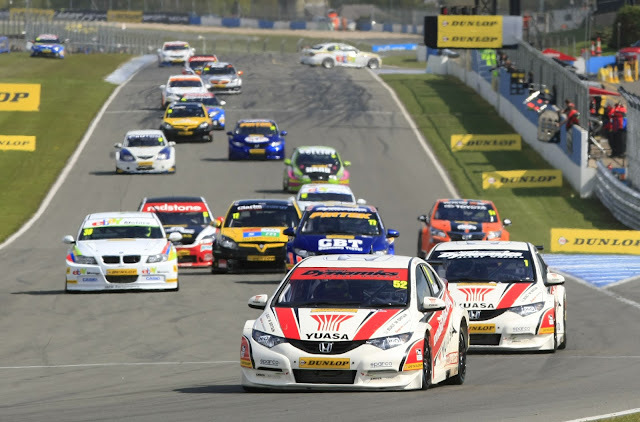 Mat Jackson and Gordon Shedden shared the wins in today’s three highly-charged Dunlop MSA British Touring Car Championship races at Leicestershire’s Donington Park circuit. But it is Jason Plato who, despite a crash, still leads the points table as Britain’s premier motor racing series heads south for its next three races at the fastest circuit on the calendar, Thruxton in Hampshire, on the weekend of 28/29 April. Plato had given his MG KX Momentum Racing MG6 a first-ever pole position in Saturday’s qualifying session. But he could only finish fourth in today’s first race behind Jackson’s Redstone Racing Ford Focus ST and the Honda Yuasa Racing Team Honda Civics of Shedden and team-mate Matt Neal. Shedden then led home Neal in race two for a dream 1-2 result for the factory Honda squad with Jackson following in third. It also meant the season’s first five races had each been won by a different driver, while Neal now took over the championship lead after Plato crashed out in a tangle with Robert Collard’s eBay Motors BMW. In race three Jackson crossed the line in first ahead of Plato and Shedden. But officials then demoted Plato to third with a time penalty after they judged he had unfairly bumped Shedden off the track at the final bend. Officials also later excluded Jackson from the results after it was discovered his car had exceeded the permitted turbo boost limits, meaning the Warwickshire driver had to be content with just the one win on home ground. His exclusion also meant Shedden inherited the victory ahead of Plato and a jubilant Tony Gilham who, in his Team HARD. Honda Civic, had achieved a maiden top three result as well as his first maximum score in the Independent Drivers Trophy. Plato also moved back to the top of the standings as Neal, the reigning Champion, span out of the race in a clash with Pirtek Racing Honda driver Andrew Jordan. Meanwhile Honda/Dynamics and the Honda Yuasa Racing Team respectively have moved to the top of both the Manufacturers/Constructors and HiQ Teams championships. Jordan and his Pirtek squad have also increased their leads in the Independent Drivers and Teams title races. Elsewhere a number of teams and drivers were penalised by officials at Donington Park. MG KX Momentum Racing, Rob Austin Racing and Thorney Motorsport all received verbal warnings for moving their cars into their pit garages without permission before the session had ended. Chris James received an official reprimand and 2 penalty points on his competition licence for an on-track incident in race one plus, later, a further 3 penalty points and a £1000 fine for using abusive language and behaviour within the venue. Jeff Smith, Dave Newsham and Andrew Jordan received verbal warnings for on-track incidents. Jason Plato received a 2-second penalty for gaining an unfair advantage on-track. Mat Jackson was excluded from the results of race three for a technical infringement. MG at Thruxton : A leap into the unknown? Goff Dominates Clios at Donington Park. Honda ready for Donington Battle. Yokohama ready to roll this weekend.